One guide expressed that in Casablanca and Marrakech, “people are always running, rushing around, they have everything the need but they’re never happy, they’re always wanting more” namely money. 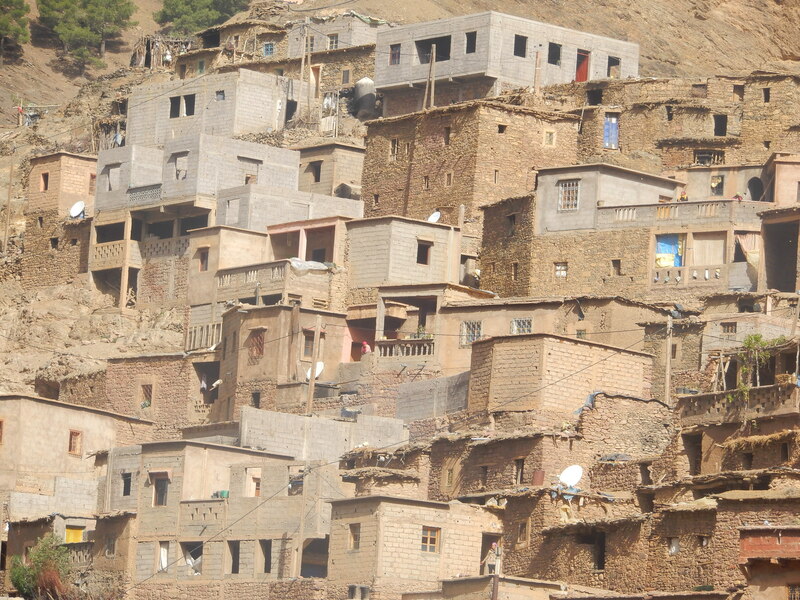 By contrast “Berber people live simple lives and make the most of the resources they have”. When we visited a Moroccan Berber home, the man of the house (who also happened to build the house) was waiting to welcome us into his home, one by one. We were at liberty to wander around the house and the outside, before sitting down for some home made mint tea. All Berber villages have electricty but they still use open fires for boiling water in those fabulous giant teapots. They had stunning views of the ice capped mountains behind them and the greener pastures in front of the house. Apart from the bleating of sheep and the whizz of the odd scooter, it was blissfully peaceful up there. Donkeys are a key method of transportation for Berber people. As we were leaving, someone was taking the flock of sheep out for a walk, and lots of local Berber children came out to watch ‘us tourists’ leave – and of course they were very happy to receive sweets or money!! It’s nice to receive a treat now and then so why not give a treat now and then! The elder children tend to look out for the younger one’s – like a second parent. Apparently, Berber girls are usually married by age 17/18 years old. Our guide shared that at a Berber muslim funeral you will never see women in attendance, only men attend. One guide expressed that Berber people like to live a simple life, making the most of the natural resources they have because life is complicated enough. The High Atlas Mountains are visible throughout Marrakech, they always seem to be on the horizon, and driving into them was quite something, it’s difficult to describe, and photographs don’t really convey just how ‘awesome’ it feels being up there. From the ground I would never have guessed there were seemingly endless roads weaving through the Atlas, they seem completely hidden until you’re actually driving on them. I mentioned before that they’re working to widen the mountain roads, and they’re creating a lot of rocky debris and dust in the process. Another interesting thing is the different landscapes of the Atlas Mountains, they vary in colour, textures. The Atlas Mountain surfaces were a kaleidoscope of colours and textures as we drove, every so often I’d spot a woman with baskets of grass on her head, or a shepherd with a flock, a clay mud building or a hooded figure walking alone. The sights of people are so well camouflaged into the scenery that if you blink you miss them. Neighbours to the home we visited…just a short walk! This school was about a three minute walk from the home we visited….we were told the school was closed that day due Moroccan teachers being on strike. (I Googled this later that evening…) Whilst in Morocco teachers had been protesting in Rabat (the capital), demanding higher pay, it was all over the news. Water sprays had been used to try and control the crowds. The government’s response at the time had been an instruction to teachers to return to work or face the sack. The little villages and towns in the Atlas Mountains might as well have been a million miles away from the craziness of Marrakech below. All manner of fruit can be found growing in the Atlas Mountains including cherries and strawberries. We drove through a local Berber town and learned that many Berber communities will get into a van, drive down to the market and then all get in the van to get back to their communities higher up the mountains. Others go down to the markets by donkey. Some Berber homes have straw roofs and walls made from straw and clay. Our guide explained that all Berber people in Morocco are muslim but just over 1000 years ago they were of mixed religions/faiths, before Islam came along. Who knew how pretty rocks could be……those mountain drives really brought home (yet again) just how much beauty there is on this planet of ours. At 2260 meters above sea level we found ourselves driving through some very light snow, while temperatures reached 30 Celsius+ back down below. It’s a different life, a different world up there really, I feel very blessed to have gained a snapshot of it whilst making it back safely to ground level. You want to see some of the road edges up there, and the sharp bends. Where there were barriers they would probably have been useless, and we saw many barriers that looked like they had been driven into and were now crushed and hanging over the edge. Whenever we saw a lorry coming towards us I said a quick prayer and held my breath lol, honestly, ‘narrow’ is an understatement when it comes to describing those roads. Some of the drops (that you will feel like you’re an inch away from) are like staring death in the face. “Technical stops”, that’s what Moroccan tour guides call a photo or toilet stop – or some prefer to call it a “hydraulic stop” yep. During one of our technical stops there was a shop selling all sorts of lovely things. I wanted a couple of things and decided to have another bash at this whole battering thing (with a lot less energy that I had at the beginning of the holiday). I didn’t like his price and he didn’t like mine. He came over to me with a big smile and took the items out of my hand and put them back on the shelf!!! What the….??? I’m thinking, this is a new one….. OK, I’ve met my match here, he’s not even trying to haggle with me – is this the Atlas Mountain way? I waved goodbye with a smile, not knowing whether it was a joke or not, but he was still smiling (near laughing) and waving back!!! I’m sure I heard him calling as I was getting back into our vehicle, but didn’t want the items badly enough. I had more success with this very humble mountain seller during another ‘technical stop’, he (and another) were selling crystals and fossils they’d found in the mountains and were much easier to bargain with then sellers in shops. Such fantastic presentation and such simple yet happy lives. Too good, Cherryl. Yes absolutely true and agree totally with your words, Cherryl. Welcome. But, this one was really friendly … and tried to sell me a carpet! !